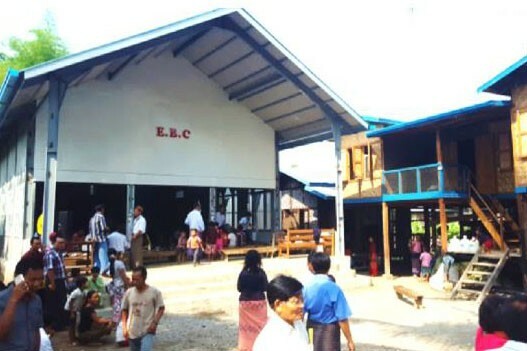 We praise God that as of the end of May 2018, a couple of months before the peak of monsoon season in Myanmar, all three churches were meeting inside their respective buildings. 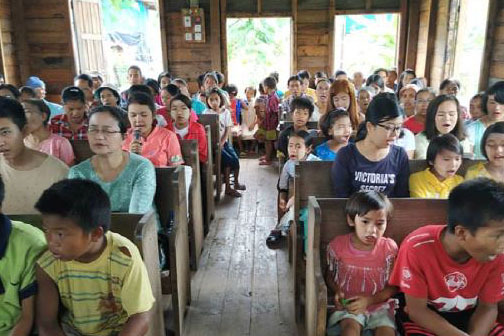 Dedication services for two of the churches had been held, and a “Tentmaking Training Center” is in place to help all three of these churches become self-supporting and able to send missionaries of their own. We've been referring to these churches as the "New Church Plant," the "Sister Church Plant," and the "Migrating Church" for clarification purposes. Here are updates for each one so that we can praise the Lord together for the work He has done. Pastor Tsang is a church planting missionary sent by the a church denomination in Myanmar to establish this new church plant. When he and his wife arrived in the village 4 years ago, he was ridiculed, including having both insults and rocks thrown at him, as well as being beaten by his Buddhist, Muslim, and Catholic neighbors. But this pastor used the relief funds that were provided to give to anyone in need, whether they had mistreated him in the past or not. He and his wife also provided daycare for the children of families while the parents rebuilt their homes and agricultural livelihoods after the floods. This small, 3-year-old congregation provided the foundation for a permanent building, and it was the designated gifts to this project that saw the building to its completion. The dedication service for the church building was held Sunday, May 20, 2018. 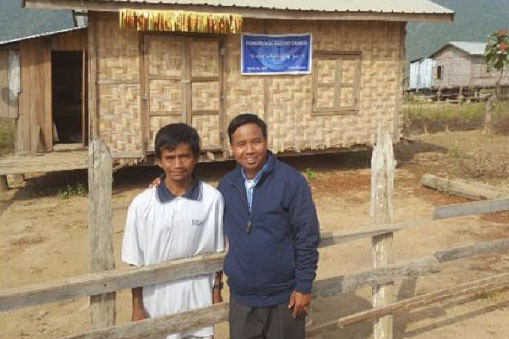 Pastor Nang was an itinerant evangelist in Myanmar prior to the 2015 flood. 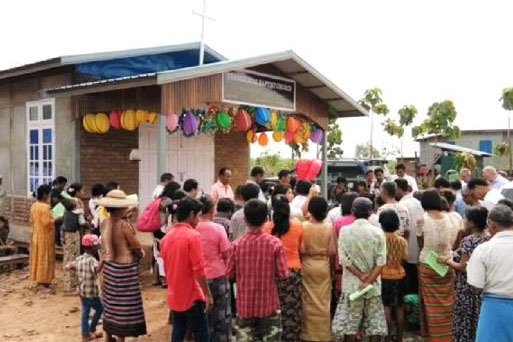 After the flood, his church denomination in Myanmar asked him to plant this church. Once again, financial support and lay leadership for this new church plant came from a neighboring church in the denomination, and in partnership with that effort, the designated gifts to this project saw this building to its completion. 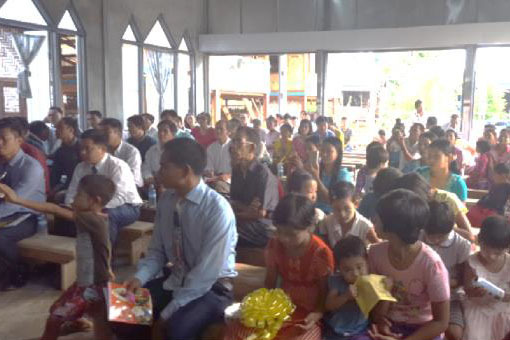 The dedication service for this church building was held on Monday, May 21, 2018.
good housing, but also cost these farming villagers their livelihoods without new farmland to work. And it didn't help the church that was meeting in the village. So in January, 2017, the congregation of 130 was still meeting under a tarp that not surprisingly got destroyed in a storm as well. 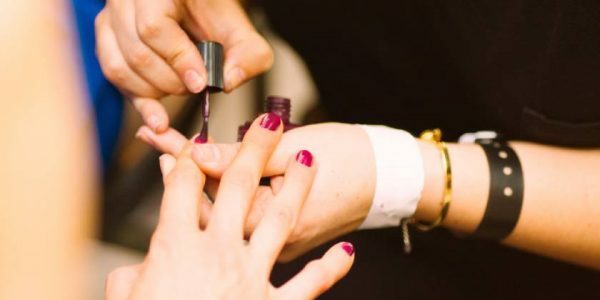 Due to the immediate need, the church leadership amended their original plan to construct one church buiding, and instead applied your gifts to a creative solution. They took apart a church building from an abandoned village piece by piece. Then piece by piece moved the building over 20 miles and reconstructed it. In the future they plan to use this building for a preschool ministry once a more sustainable building is built for their church. With the balance of the gifts you provided they began to build a two-story church building, and are working to complete the building project later this year. 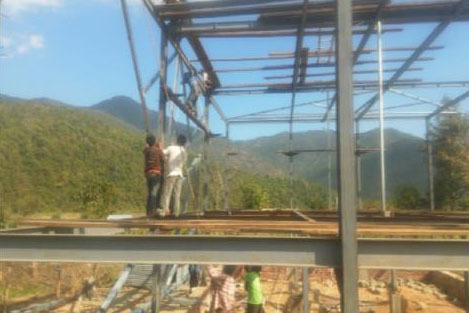 Live Global has identified three churches that have rather unique circumstances and particular needs for the construction of new church buildings. Interested in going to Myanmar to see firsthand what God is doing, and also use your gifts and serve?